Three drug dealers were shot dead with a sub-machine gun in Hertfordshire in a row over cocaine, a court has heard. 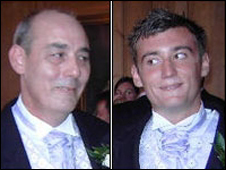 Keith Cowell, 52, his son Matthew, 17, and Tony Dulieu, 33, from Essex, were "executed" at the Cowell's Bishop's Stortford house on 28 August, 2007. Brothers Kevan Thakrar, 21, of Lomond Way, Stevenage, and Miran Thakrar, 24, of no fixed address, deny three counts of murder at St Albans Crown Court. They also deny attempting to murder two women at the Plaw Hatch Close house. The brothers stabbed witnesses Christine Jennings, 54, and Matthew Cowell's girlfriend, Claire Evans, 23, after they ran out of ammunition, the court was told. Mrs Jenning's son Ian, who had taken cocaine to the Cowell's home, escaped by hiding in the back garden. The Thakrars also deny possession of an Ingram Mac 10 sub-machine gun with intent. Prosecutor Stuart Trimmer QC, said: "The backdrop and reason for this slaughter is set in drugs dealing. "Disputes in this world are settled with violence - sometimes gross violence. The instant dispute appears to be over the quality of the drugs previously supplied. "The nature of this slaughter propels this underworld into public gaze. "The men died as a result of multiple gunshot wounds. The crown says they were shot whilst they were unarmed and defenceless. The evidence from those who survived and saw it is that these murders were in the nature of a planned execution." Miran Thakrar escaped from the UK to Cyprus the morning after the shootings, the court heard. He returned to the UK on 5 December, 2007 and was arrested. The defendants' brother Jay Thakrar, 25, of Lomond Way, Stevenage, denies two counts of assisting an offender. Their father, Atul Thakrar, 47, of Compton Place, Northwood, London, pleaded not guilty to assisting Kevan Thakrar to attempt to leave the UK between 28 August and 5 September. Co-defendant Amanda Dansie, 21, of High Street, Buntingford, Hertfordshire, pleaded not guilty to assisting in the escape of Miran Thakrar from the UK between 28 August and 9 September. Yilay Tufensoy, 20, of Nags Head Road, Enfield, London, denies two charges of assisting an offender.